ATLANTA (WTVD) -- The streak is over. Home field advantage is on hold. The Carolina Panthers could not overcome every obstacle on game day, a first this season. 14-1 is an impressive record by any standard, just not the one the Panthers were hoping to have after week 16. Early it looked like another easy win. Cam Newton drives the team down on their first touch and runs into the end zone for a 7-0 lead. After a fumble and two drops it looked like the Panthers would get the ball right back, but Charles Tillman was called for a personal foul giving the Falcons new life. With it, Atlanta converted four more third downs and answered. Late in the 2nd quarter the Newton took a sack on 2nd and one that knocked Carolina out of field goal range. Instead of a chance to lead at the half, it was a tie game. A far cry from the 28-0 lead the Panthers enjoyed at the half in Charlotte. After a Panthers field goal in the 3rd, Atlanta converted its 7th 3rd down on a ridiculous completion to Julio Jones who out-jumped linebacker Luke Kuechly after safety Kurt Coleman had fallen down. Falcons took a 14-10 lead at that point. 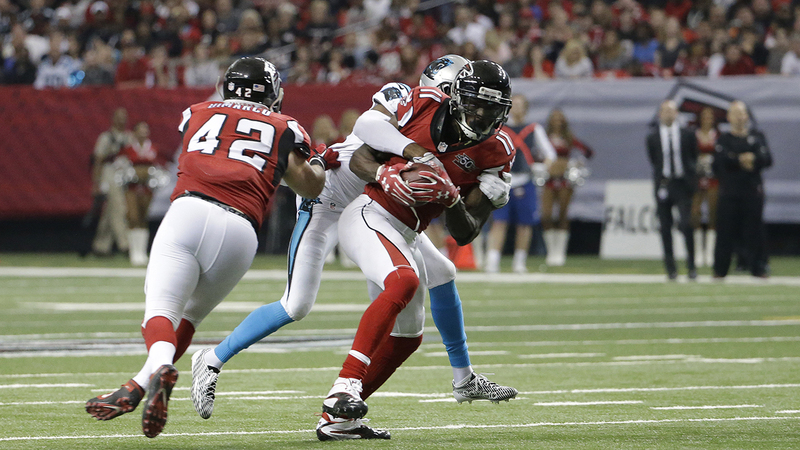 Unlike Odell Beckham Jr. last week, Julio focused on production and touched the Panthers with 9 catches and 178 yards. Career highs against the Panthers. So, a unique afternoon in what has been a magical season. Still a lot to play for. Time to regroup and Keep Pounding.